Happy New Year! Welcome to BigAlsHouse.com's first post of 2007. Although 2007 is only 3 days old, Big Al has already accomplished a lot so far. This New Year's weekend I celebrated with Jo in Disneyland or as Archie Moses (aka Adam Sandler) of Bulletproof would say, "Did-ney-land". The trip was 3 nights and 4 days at the fabulous Anaheim Hilton & Towers - quite possibly the worst Hilton property ever! The problems included: expensive parking (understandable), old rooms (disgusting), no refrigerator to store the beers (inexcusable), hearing the neighbors walk all over the place (terrible) and no upgrades for their "valued" customers (despicable). Sometime this week I'm going to write a letter to Paris personally and complain. The trip was short but tons of fun. The first night was spent in Downtown Disney at the Rainforest Cafe where we dined on Hamburgers and Pasta. New Years Eve day & night were spent at "The Happiest Place on Earth" where we enjoyed the ever popular rides such as Pirates of the Caribbean, Space Mountain, Thunder Railroad, The Haunted Mansion & Indiana Jones. The park was so crowded! Lines extended 2+ hours. The Fast Ticket system where you could make an appointment to get on a ride sold out on most of the popular rides. The midnight countdown was really cool. If you have a chance, it's worth being in the park for this. Because of the crowds the main gathering points such as It's a Small World and Cinderella's Castle were overwhelmed with people. Jo and I decided to find a spot nearby the Castle. 10 seconds before midnight 10 streaks of fireworks went off behind the castle and then a huge 10 minute firework show went off. It may have been the best firework show I have ever seen. Growing up I was so used to the typical firework show, but that's not the Disney way. They went all out for those 10 minutes with all types of fireworks - happy faces, Mickey Mouse faces, fireworks that went everywhere, etc. Kudos to Disney for the show! 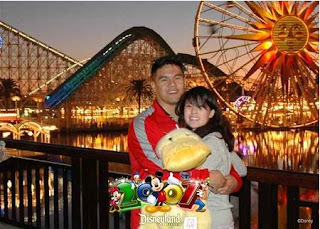 We capped off our weekend at California Adventures - my first time. I'm a traditionalist, and I will always back up Disneyland as the best theme park in the world, but California Adventure was really fun and it definitely could hold its own. They really did a good job at capturing the feel of the state of California in several hundred acres of theme park with a Disney feel to it. On a side note, they had carnival games there similar to what you would see at your local county fair. Being an excellent handler of balls, I decided to play the milk can toss game where you lob a softball into a milk can from approximately 5 feet away. The trick is to swish the ball into the can because the rim isn't very forgiving. You get 8 balls for $5. I was able to win Buttercup the Duck on the 64th ball. (You can do the math to see how much I spent). However, the joy of winning in front of others and the pride you get for carrying around a large stuff animal around the theme park is worth all of the money. I hope everybody had a fun and safe New Years celebration. I had to be the first comment of 2007!! Big Al Wishes Everybody A Happy Holiday!